Cities along San Francisco Bay have traditionally defended themselves against the menacing ocean with walls, levees, and pumps. But as seas rise, structures that keep water away may not be able to defend against an uncertain future. So urban and landscape designers are looking for alternatives. Near Colma Creek, in South San Francisco, new ideas imagine embracing the bay, allowing water to move onto land, and allowing people to move on to water. If sea level rise reveals the vulnerabilities in our traditional relationship with water, it's also opening the door to a new kind of thinking about the permeable relationships between water, land, and people. Colma Creek trickles to life among ferns and green grass in the saddle of San Bruno Mountain, and rolls through industrial flatlands to San Francisco Bay. The mountain’s foothills once tumbled almost directly into the waters of the bay, but decades of landfill and urban development have pushed the mountain and the shoreline apart. Now, creek waters flow in a concrete channel past boxy warehouses and industrial parks. I hop a short chain link fence with Ariel Cherbowsky-Corkidi, program director for San Bruno MountainWatch. We crouch in the nook of a low bridge on a windy evening. “Colma Creek had a really, really big salt marsh at its mouth that spread a pretty good ways inland,” Cherbowsky-Corkidi says. Not anymore. We can smell tidewater, salty and fresh; so can shorebirds standing on dry patches of the creekbed. But the creek itself is locked in gray, 20 feet below us. A for-hire LimeBike rusts morosely in the shallow ripples. Cherbowsky-Corkidi says people have separated themselves from this creek. To solve the problems of sea level rise in South City, experts say that positive connection must be restored. As part of the Rockefeller Foundation’s Resilient by Design competition, Mullane’s Hassell Plus team set up a temporary office in a former bank in South San Francisco. Inside, Mullane grew native plants -- the kind that would thrive along a rebuilt shoreline -- and shared ideas for reconnecting the downtown core to the waterfront. 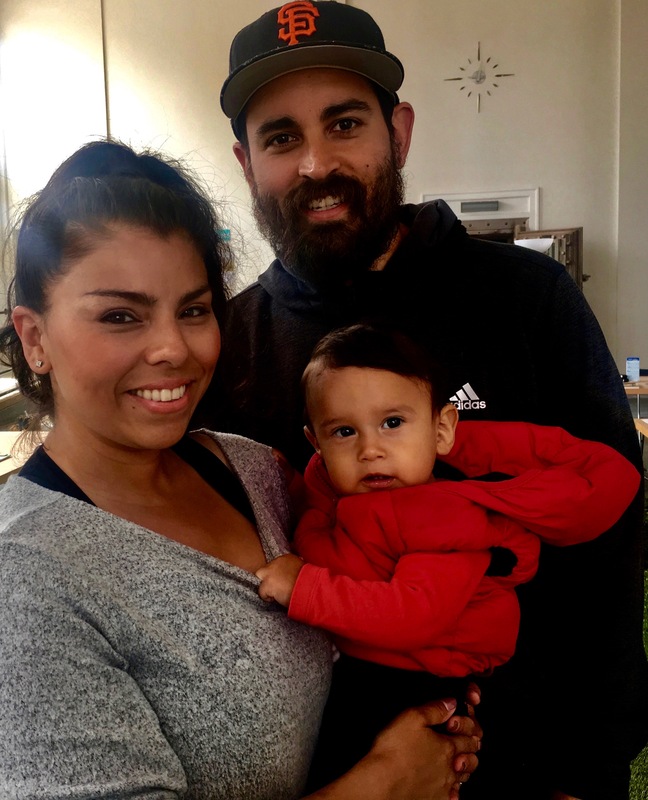 On a Saturday in April, the Casillas family wandered in: Brisa, her husband Danny, and their one-year-old son Cruz. 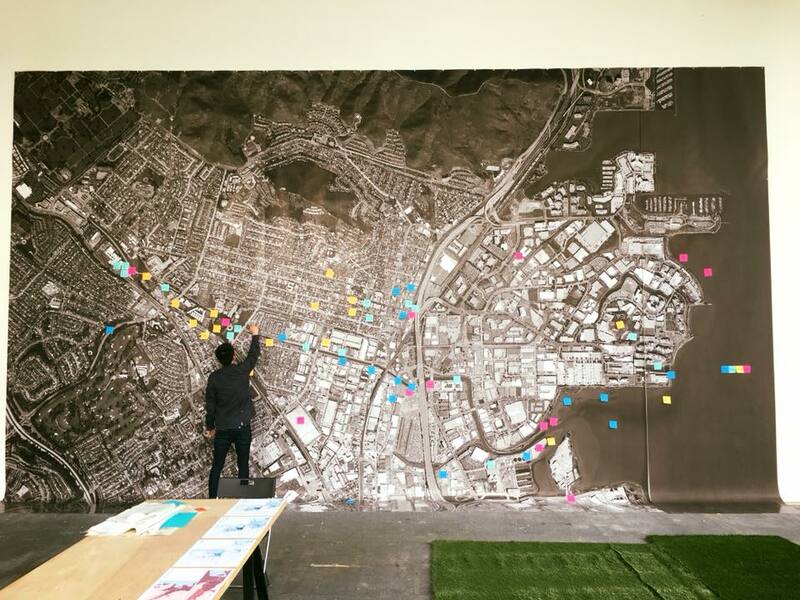 As they study a massive wall map, 30-feet by 20-feet, Mullane shows them where the bay will rise, and Brisa realizes their home and their jobs will be awash in blue within a few decades. Danny Casillas says he didn’trealize flooding had anything to do with rising seas. “I guess I never thought about it like that,” he says. But he does remember one incident of high water, fifteen years ago. Mullane tells Casillas that those high waters were a warning. 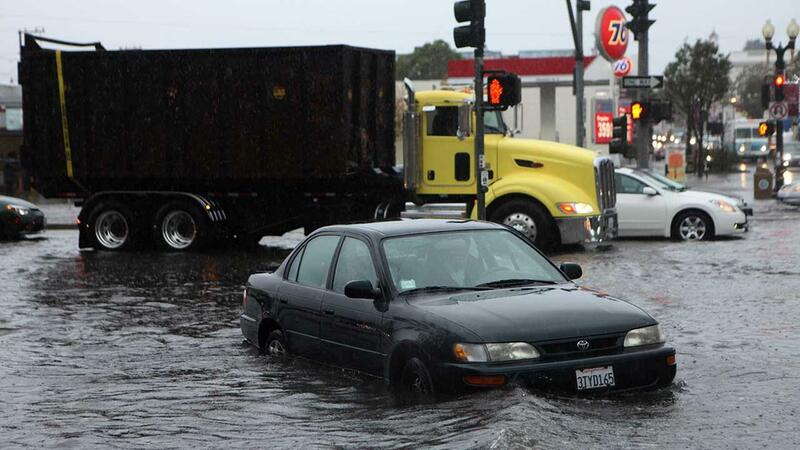 More often now, extreme rainstorms and big tides will collide and fill the channelized Colma Creek, spilling floodwaters into the streets. In a proposal the Hassel Plus team presented publicly in May, they argue the solution is less concrete and more green. What would slow the water down is a wide, soft creek bottom that can absorb wave energy. Plus plenty of trees and native plants to sop up excess water. Then Mullane suggests expanding parkland surrounding the creek. Redeveloping open space into a soccer field would not only expand recreational opportunities at the shoreline, but also diversify them. The narrow concrete Bay Trail is useful for walking or riding a bike, both solitary, small-group activities. Soccer, the Australian Mullane points out, is a pastime that attracts crowds, and is popular with a diverse population. What that means is that one Hassell Plus-proposed soccer field could both re-engineer water flow and re-engineer the way people see the shoreline. Mullane and the Hassell Plus team’s proposal for Colma Creek isn’t much more than an idea yet. The Resilient by Design Competition seeded conversations and ideas in 9 communities around the bay, but won’t fund entire projects. The argument that rebuilding a soft landscape can help the region cope with sea level rise has already found favor with Bay Area voters. Two years ago, across 9 counties, 69% of them approved Measure AA, a 20-year effort to bring marshes back. “[Tidelands and marshes] are remarkable things both for the ecosystem and for flood protection,” says Pine, who also chairs the San Francisco Bay Restoration Authority. The authority eventually will hand out $500 million for potential projects, raised from Measure AA’s $12 annual parcel tax. In the first round of funding twenty-two sites applied for support; the restoration authority will jump-start just nine of them. Adaptations to rising seas that focus on green or natural infrastructure may cost less than walls, pumps and levees, which demand mechanical maintenance and more frequent upgrades. But even regional projects can cost tens of millions of dollars, and need approval from multiple local, state and federal agencies. 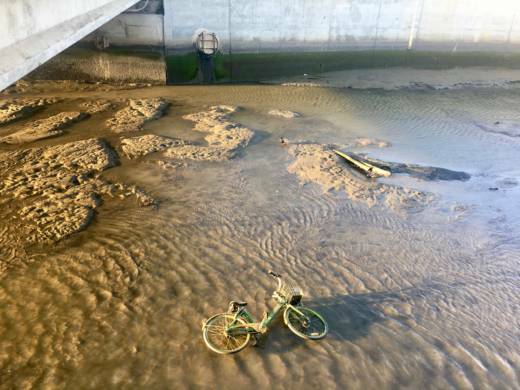 Still, around Colma Creek, “It's one of the few creeks in the county where we actually have a revenue stream to make some changes,” Pine says. San Mateo County created a flood control zone there in 1964. Colma Creek isn’t unique in its historic separation of land and water. Neither is the starved shoreline of South San Francisco. Eighty percent of historic marshes around the bay are gone. Through its widening, through the eras of meatpacking plants, and dumps, and industrial sites, land along the shoreline has reflected South San Francisco’s relationship to water, even just by distance from it. Now local leaders and designers say that sea level rise is making closeness to water inevitable: they’re suggesting we learn to embrace the water we once pushed away.